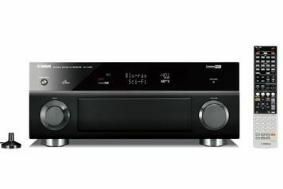 Yamaha unveils high-end 3D-capable home cinema receivers | What Hi-Fi? All three – the RX-V1067 (£850), RX-V2067 (£1100) and RX-V3067 (£1500) – are equipped with HD audio decoding, Yamaha's Cinema DSP signal processing and HDMI 1.4a connectivity with 3D and audio return channel. Supports HD audio and video sources, 8 in/2 out HDMI v1.4a, HD audio decoding with Cinema DSP 3D, new GUI (graphical user interface), new YPAO auto set-up, network functions, and control via web browser. 9.2-channel, 8 in/2 out HDMI v1.4a, HD audio decoding with Cinema DSP, HQV video quality, new GUI, new YPAO with Reflected Sound Control, Scene functionality. 11.2-channel, 8 in/2 out HDMI v1.4a, HD audio decoding with Cinema DSP 3D, HQV video quality, new GUI, new YPAO with Reflected Sound control, Scene functionality. There's also a hidden control panel, which includes USB port, Aux input terminals, Zone 2/Zone 3/Zone 4 switches and a YPAO optimised microphone jack. And the RX-V3067 comes with two learning remotes, for use in different zones. We'll have an exclusive First Test of the Yamaha RX-V1067 in the November issue of What Hi-Fi? Sund and Vision, on sale September 17th.